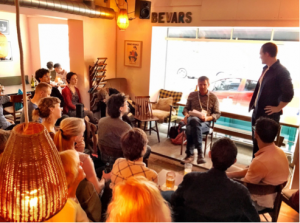 Featured talks by FENS-Kavli Scholars and its invited guests – spreaded in 10 different locations in Berlin in the evening of 8 July – will inspire discussions centered around emerging topics in neuroscience with direct relevance for society. FENS Forum 2018 attendees are highly welcome to participate in these engaging discussions. Come join in communicating neuroscience to general public! No registration required. 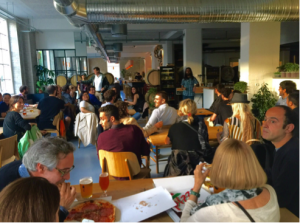 Free drinks provided to the first 50 attendees to each of the 10 locations. Download here the poster comprising all talks, speakers and locations. Download below the pdfs with the individual talk ads, speakers, timing and locations. 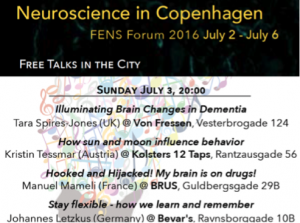 Accompanying the FENS Forum and starting in Copenhagen in June 2016, the FENS-Kavli Scholars organised talks for the general public in informal settings. 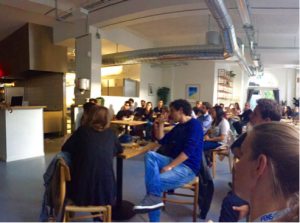 Our aim was to share our fascination with the brain and to showcase the most interesting areas of neuroscience for lay audiences in a fun way.